Jewellery by Kima and Photography by Alexander Delapenha on sale! The evening will be hosted by recording artiste, Sanjay. Admission: $500 presold, $700 @ gate. Take advantage of presold entry up to 8pm on show night!!! 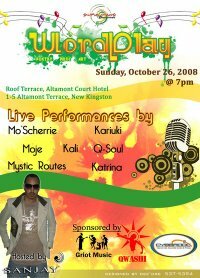 For more information on WordPlay, check out www.myspace.com/simplechaosentertainment or email chaosimple@gmail.com. there is an open mic segment. Just come by! Also, if he wants to perform on upcoming shows, send an email to chaosimple@gmail.com. Another great upcoming Artiste (Singer) Stratdon. Is it possible to get him on this show? ?